This super simple recipe will turn regular vanilla ice cream into a gooey, chocolatey Creme Egg dessert in no time. Top tip - Don't over blend the ice cream and milk. We don't want to end up with a milk shake! Unwrap and chop up all of the Cadbury Creme Eggs. Divide the crushed eggs in half and set aside. Crush or chop the chocolate chips and set aside. Blend your choice of vanilla ice cream (we recommend Ben & Jerry’s) and milk. 30 seconds before the end of blending, pour in one half of the Creme eggs and blend for 30 seconds longer. Empty the contents of the ice cream into 2 glasses or bowls and fold in the crushed chocolate chips. Sprinkle the second half of the Creme eggs on top of both desserts. Enjoy your homemade Creme Egg McFlurry immediately! If you don’t have any Cadbury Creme Eggs to hand, don’t fear! 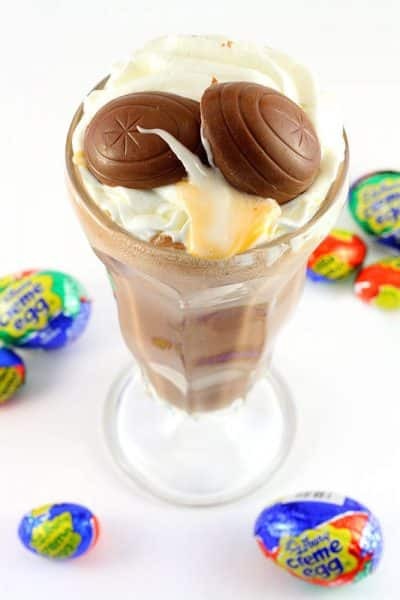 Try our scrummy homemade Creme Egg copycat recipe.